Please refer to the webpage Venue, maps campus etc for maps illustrating the location of the three buildings on the campus. Aarhus is the second largest city in Denmark with a population of approximately 325,000. The culture is lively and young, mainly due to the city’s large student population (approx. 50,000). Aarhus is really a remarkable place and offers many attractions – such as the open-air museum “The Old Town”, Marselisborg Castle, Queen Margrethe II’s summer residence and Moesgaard Museum. Discover its delights for yourself. Most things are within walking distance and the city of Aarhus is the place where every wish can be fulfilled in fascinating and inspiring surroundings. One of the major attractions in Aarhus is the Open Air Museum ‘Den Gamle By’. The 'Den Gamle By' (meaning ‘The Old Town’) is a unique attraction in Aarhus for the whole family to go on fascinating journey back in history. The museum is awarded the maximum three stars in the Michelin Travel Guide. Here you will meet people dressed and acting as folk at the end of the 19th century, and also as how people lived and worked in 1927. You can also take a walk through a town district from 1970s' Denmark, complete with streets, townhouses, shops, backyards, and workshops re-erected exactly as they stood in the past. Getting to Denmark is easy. Denmark is a peninsular in northern Europe, which means you can go by car or train from any of the North European countries. Aarhus is close to the E45 motorway. There are flights from several destinations throughout the world to four different airports in Denmark. If you arrive in Copenhagen Airport – the largest in Scandinavia – you can either choose to fly on to Billund Airport, or Aarhus Airport, or you can travel by train or rent a car. From both Billund and Aarhus Airport there are airport buses to Aarhus. Aarhus Airport – AAR – www.aar.dk. Aarhus Airport is located at Tirstrup 40 km north-east of Aarhus, offers direct international flight connections. There is an airport shuttle bus to Aarhus from Aarhus Airport. Tickets are sold on the bus. Most foreign currencies and credit cards are accepted. The travel time from Aarhus Airport to the city of Aarhus is approx. 50 minutes. One-way fare costs DKK 115 (May 2018). There are predefined stops along the bus route, final stop is at the railway station in the city centre (Hovedbanegården). Billund Airport – BLL – www.bll.dk. Billund Airport is located 100 km south of Aarhus and has many international flight connections. There is an airport shuttle bus to Aarhus from Billund Airport, called RUTE 912X. Tickets are sold on the bus. The travel time from Billund to Aarhus is approx. 1.5 hours. One-way fare costs DKK 160 (May 2018). The bus stops at the railway station in the city centre of Aarhus (Hovedbanegården), final stop is at the bus station in Aarhus (Rutebilstationen). Copenhagen Airport – CPH – www.cph.dk. Copenhagen Airport is located at Kastrup and is Scandinavia’s biggest airport with about 65 airlines operating from Copenhagen Airport and with more than 20 million passengers every year. If you land at Copenhagen Airport, you may take the train directly from the airport to Aarhus. 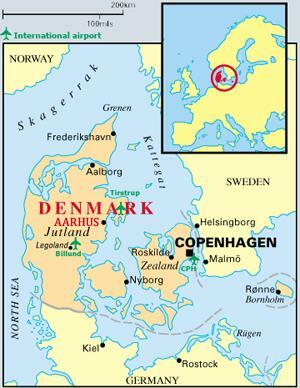 The train from Copenhagen to Aarhus operates on an hourly basis. Travelling time is approximately 3 hours. For further information, departures and reservation please see www.rejseplanen.dk. The train from Copenhagen to Aarhus operates on an hourly basis. Travelling time is approximately 3 hours. There is a direct train connection from Copenhagen Airport to Aarhus. For further information, departures and reservation please see www.rejseplanen.dk – choose UK for information in English. There is ferry service between Aarhus and Kalundborg, Aarhus and Sjællands Odde and from Norway and Sweden to Frederikshavn and Hirtshals. As in all parts of Denmark, Aarhus has an efficient road network which allows for easy driving access directly to the city – Hamburg is only a 3-hour drive. It is possible to park at the venue.